The name of this parish comes via the Norman French from the Latin word Ecclesia, meaning a church, and that is entirely appropriate, because St Mary is pretty much all there is to Eccles these days. 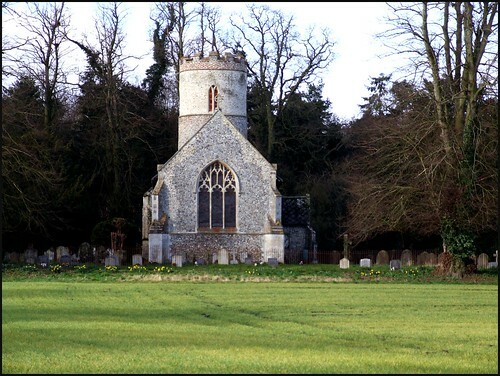 The church sits tree-surrounded in the fields, a long track leading up to it lined by trees that Mortlock tells us were planted to celebrate the Festival of Britain. A greater curiosity are the iron railings which completely surround the graveyard. These must have been so common before they were grubbed up in a well-meaning but misplaced fit of patriotism during World War II. Intended for melting down and conversion into Spitfires, most of them ended up dumped in the North Sea. Those at Eccles are a rare survival. St Mary's round tower has been recently restored, and the whiteness of it forms a beacon for miles around. Here we are in the rolling fields of south Norfolk, but I am afraid any chance of rural peace is rather spoilt by the noise from the Snetterton race track, barely a mile off. However, the trees that shroud the graveyard are beautiful, and St Mary is a real haven for the visitor and pilgrim, making itself open every day to receive the stranger within the gate, as the Gospel demands. Rather oddly, there is a doorway on the outside of the south wall giving access to the roodloft stairway. The reason for this is there was once a south aisle, and this entrance was then at the east end of the arcade. The filled arcade is apparent from the outside, but the 14th century doorway was moved back into a new position when the aisle and porch were demolished. This becomes obvious as you step inside. You turn to see that you are actually entering through the most westerly bay of the arcade. The frosted glass that fills the upper part of the arches isn't entirely successful, but it is nice to be able to see the pillars and arches standing proud of the wall. The interior of the church fits exactly the setting, for this is an intensely rustic space. Even the old patterned carpet seems to speak of days now gone. In the little vestry are photographs of the church choir here in the early 1960s. Dressed in their cassocks and surplices,accompanied by their priest in full eucharistic vestments, they are shown processing up the narrow nave behind the crucifer and the acolytes with their candles, and are a reminder that nothing appears as ancient as the recent past. St Mary must have been very High Church. I couldn't help thinking, with a slight twinge of nostalgia for my own childhood, how beautiful those full choral services out here in the fields must have been. Up on the wall, a memorial has fine lines of moss growing in its lettering where damp has collected. Around the chancel arch are gorgeous little faces of animals and people, similar to those you see around the doorways of some of our great cathedrals. Up in the sanctuary is one of those elegant double piscinas, and a plain, stone-legged table to serve as the altar. Its simplicity lends a gravitas to the medieval mensa stone recovered from the graveyard in the 1940s, and now reinstated in its original place. It is still considered slightly papist for an Anglican church to have a stone altar, but I don't suppose anyone bothered about that in the excitement of recovering the past. Another saving remnant is on the north side of the chancel. This is a 19th century window moved here from St Michael's church in Southwark in the 1960s. What a contrast! From the urban heart of what was then the biggest city in the world, to this little church alone in the fields. If it had ears, perhaps it would take comfort from the sound of the racing cars on the other side of the woods.